Cut either end of the beets so they can stand up, then place in separate small baking pans with 1 teaspoon of olive oil in each. Add ½ inch of water, 2 thyme sprigs, 2 bay leaves, and ½ teaspoon whole peppercorns to each pan. To the red beet, add the balsamic vinegar. To the golden beet, add the sherry vinegar. Cover each pan with aluminum foil, and roast in the oven for approximately 45 minutes to 1 hour, or until fork-tender. Toss the walnuts with 1 tablespoon of the walnut oil, the remaining thyme sprigs, salt, and pepper. Transfer to a baking sheet, toast for 10 minutes in the oven with the beets, then discard the thyme and set the walnuts aside. Dissolve the honey with the red-wine vinegar. Add the shallots and chopped thyme and whisk in the remaining walnut oil and the ¼ cup olive oil. Season with salt and pepper. Remove the beets from the cooking liquid, discard the liquid, and place the beets in the refrigerator. Once cool, peel and thinly slice the beets on a Japanese mandoline, keeping them in a nice stack. Just off-center on each of 8 small chilled plates, fan 4 to 5 slices of beet, slightly overlapping and alternating colors. Split the endives lengthwise. With a paring knife, carefully remove the core and cut the endives horizontally into 1-inch pieces. Toss with the frisée and the parsley leaves, lightly dress with the vinaigrette, and season with salt and pepper. Place a small amount of salad in the center of each plate. 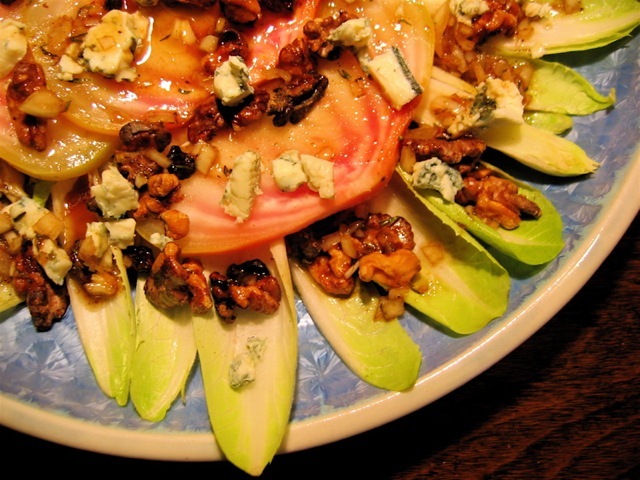 Brush the beets with some of the remaining vinaigrette, scatter the toasted walnuts, and crumble hearty chunks of the Saint Agur blue cheese on top. Serve immediately. Stilton or Roquefort cheeses are good substitutes for the Saint Agur blue cheese.